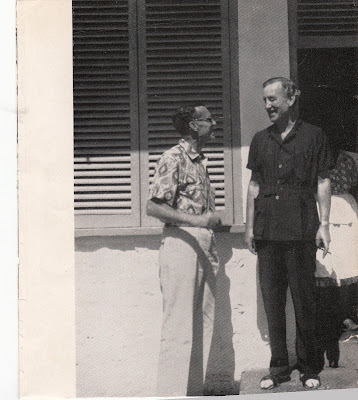 Ian Fleming wrote all of his James Bond books and short stories while in residence at Goldeneye, where he stayed most of January and February of every year. Of all those individuals who claim that Fleming based his protagonist on other real persons, there is only one person in the world who Fleming himself acknowledged and that is James Bond, the American ornithologist from Philadelphia. Fleming claimed to have taken the name James Bond from the author of the book "Birds of the West Indies," which he said was his "bible" and kept handy so as to identify the many species of birds that frequented his backyard and private beach. After Mrs. Bond read some of the books, she wrote to Fleming to say that she noticed some of the places and situations Fleming placed the fictional 007 were familiar to her and her husband, who frequently traveled the Caribbean. Fleming responded that he hoped that Bond would was not upset at the "theft of his identity." Then in the winter of 1964, while in Jamaica on a bird hunting expedition, Mrs. Bond convinced her husband to take a road trip along the North Shore, and while doing so, they stopped at Goldeneye to pay an unexpected visit. When Bond knocked at the door, Fleming's cook Violet answered the door and when she asked "Who shall I say is calling?" Bond replyed, "James Bond," Mrs. Bond said Violet looked like she saw a ghost. To document the moment, Mrs. Bond snapped a photo when Fleming arrived at the door and you can see Violet, in her flower print dress in the door. Since Bond is standing on the ground and Fleming on the steps, it appears that Fleming is taller than Bond, but actually Bond is taller than Fleming. Fleming invited James and Mary Bond to stay for lunch, and they also met Fleming's friends Mr. and Mrs. Hilary Bray, who were down on the beach with Fleming's copy of Bond's book "Birds of the West Indies." There was also a Canadian Broadcast Corporation (CBC) film crew there to interview Fleming, and I've often wondered if they included any segments of James Bond in their documentary.